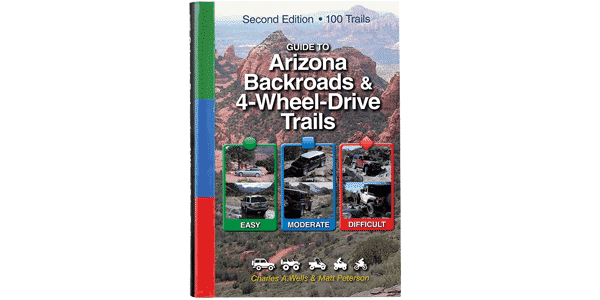 Popular OHV area for ATVs, UTVs and Jeeps. This is the first of three routes we’ve selected to introduce you to the massive and very popular Rolls OHV Area. Each route starts at a different entry point. As a general rule, routes heading north and south follow sandy wash bottoms and are fairly easy. East-to-west routes cross high ridges, where difficult obstacles are common. Although you’ll see lots of Jeeps, the area is most popular with ATVs, UTVs and dirt bikes. Expect heavy traffic on weekends. Many ATV tours come here. This trail has one moderate rocky hill at the beginning. The balance is easy. A mix of soft sand and hard-packed undulating surfaces. Run from North to South. Wished we had not done this one. No scenery. Lots of trash from shooters. The trail itself was quite annoying in that it was just up and down washes; kind of like going over those big speed bumps for miles. The end (beginning as shown in the book) has some worthwhile aspects but overall, do not go. Not a good trail for a jeep. The just finished a very large paved staging area at the beginning. Will attract a lot of activity. Probably good for kids.